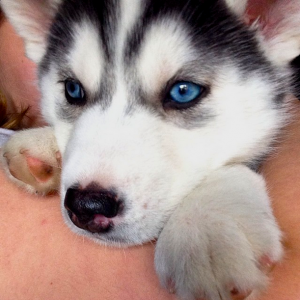 Welcome to Husky Diaries – My Own Website About Me, a Siberian Husky Puppy! Previous postYou Want to See My Silly Face? Welcome to www.HuskyDiaries.com, I’m a young Siberian Husky puppy named Aryana and this is my Siberian Husky Blog, it’s mostly all about me! Come to think of it, just about everything should be, not just this blog! While my paws might not make me a super-typer, I do enjoy sharing my adventures on my very own website here. Human keyboards weren’t designed to be used by doggy paws, so please excuse any typos! As I begin to learn more and more about how to use a video camera, I will post more and more videos. This blog captures some of my activities, even if it is just me taking another puppy nap or doing my morning stretches. I’m still getting used to water and currently being trained to run with a harness, so stay tuned and check back often for updates, I have brand new photos added to my blog daily! My vetrinerean says I can’t do too much running and I’m not allowed to do any pulling until I’m 18 months old, so right now I’m just learning the commands and taking short runs with my harness. He says I need to let my bones and joints fully develop first, but that sure does take a lot of fun away. Some of my favorite movies include 8 Below, Snow Dogs, and Snow Buddies. I enjoy reading books about sled dog teams and the great Balto. Naturally I’m a University of Washington Huskies Fan! As a cold-weather, working dog I’m waiting for the winter! This summer has been hot and I feel like I’m wearing a heavy winter jacket every time I go outside! Thanks for stopping by my website and I hope you enjoy reading my very own Siberian Husky Blog!